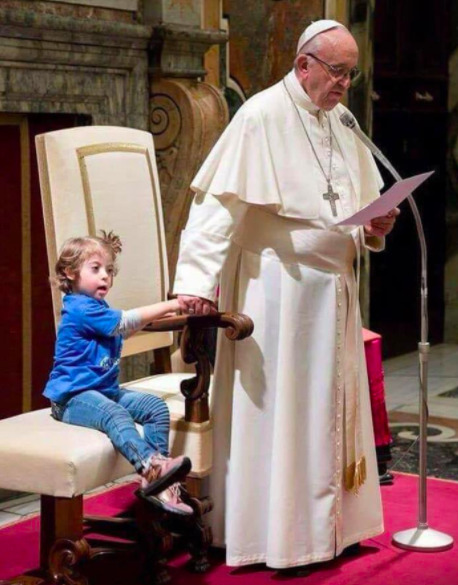 There's been a photo circulating recently of the pope standing besides a little girl with Down syndrome and holding her hand as he reads from a paper. Mostly, this has been a Good Thing for children with Down syndrome and other special needs. I have been charmed by Pope Francis ever since I read that shortly before he was named pope, he personally called his local Buenos Aires kiosk from Rome to say he'd no longer need a daily morning paper. When he went on to bring awareness and inclusion to children and adults with disabilities, I adored him even more. 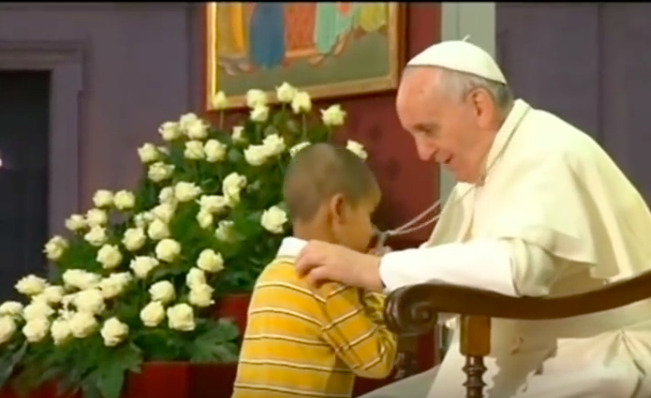 In November 2014, the Vatican held its first conference on autism and Pope Francis held a special mass for attendees and their families. "We need to break down the isolation and stigma that burden" people with autism spectrum disorders, he told the crowd. In January 2015, a man with cerebral palsy who cross-stitched an image of Madonna Dolorosa with his feet and gifted it to Pope Francis during a visit to the Phillippines. The pope took time to chat with him, no small thing when you're in a teaming mass of people. The next month, Pope Francis joined seven young people with disabilities from around the world in a Google Hangout, telling them "each of us has a treasure inside." This past October, there was another Vatican-sponsored conference for people with disabilities. Pope Francis met with Bridget Brown, a self-advocate who has Down syndrome. As she'd written to him, "The world needs to know that I don't 'suffer' from Down syndrome. I have a a full and wonderful life, and I am filled with joy to be alive." As for that little girl with Down syndrome seated beside the pope, that happened back in October, when Special Olympics Chairman Timothy Shriver had an audience with The Pope about what he called the "inclusion revolution." There were several Special Olympics athletes present, including four-year-old Gemma Popili from Rome. She presented the Pope with a pair of red Special Olympic sneakers. And then, he invited her to sit beside him. Pope Francis isn't doing this out of pity. For one, he is generally welcoming to children. Years ago, a boy wandered over to him during Family Day at the Vatican. The child greeted him. He checked out the cross hanging around his neck. He would not leave the stage, and the pope let him hang nearby. In parts of this world, children and adults with disabilities are ostracized. Even here in the U.S., they can be other-ized and treated as if they are not a full-fledged part of society. What Pope Francis seems to be doing is pointedly embracing, figuratively and literally, children and adults with disabilities. Sure, photos like the one of the pope and Gemma can be misinterpreted—it's been incorrectly reported that she wandered up to him during a papal service and he allowed her to stay by his side. But the more people see His Holiness interacting with children with disabilities, the more some will understand that our children are as worthy of being appreciated, admired and included as any are. I enjoy reading your blog but I find it dissapointing that you are holding up a man who, while he seems to be quite benevolent most of the time, refuses to believe abuse survivors when it is inconvenient for him. This is particularly disturbing considering how many people with disabilities are sexually assaulted. In the US whenever the Catholic Church is mentioned, all people can think about is sexual abuse. Yes, it is serious, but it is not the only important thing about the Church. What the pope has done for migrants is SO important. His position agains death penalty is SO important. His battle for a healthy environment is SO important. His stance against weapons is SO important. And, as Ellen writes, his inclusion of disabled children and adults is SO important. I am not Catholic, but it's not difficult to see that this Pope has made a huge difference. he has marginalized the most oppressive, right-wing, conservative components of the Church, he has shifted attention from issues such as abortion and gay rights to fundamental issues such as global poverty..... It is a bit sad to associate him with the (mostly US based) issue of sexual offences. He just completely invalidated the experience of many abuse survivors in Chile. This was a recent thing that he was directly involved in. Yes he has done good things but that doesn't excuse him summarily dismissing sexual assault survivors because he is friends with the person they are accusing. How many of us have our accusations dismissed? How often are people with disabilities dismissed as unreliable witnesses or intimidated by care givers into silence? Pope Francis is perpetuating this behavior and people look to him as an example. I was simply expressing my dissapointment that this man was held up as an example when his recent actions suggest he is not the ally many might assume. The article offers no insight to his policies regarding sexual assault.This was not the platform, it provides insight to the Pope and his regard for children with disabilities. Rather than pointing out your personal opinion on the pope, why not reply on how it pertains to this article. I, for one struggle daily with the way the way people treat and interact with my 16 year adult brother. After reading the article, I appreciated it being brought to my attention the Pope's public interaction with children of disabilities. What did you gain from this article? Jessica, I hear you. My singular focus was to applaud the pope for the good he has done bringing awareness to youth with disabilities, because that has been groundbreaking and heartening and I do think he is setting an excellent example there. Still, you're right, it would have been right to nod to what's happened in Chile and Peru, especially given the high rate of sexual abuse among people with disabilities, as you note. Last month, I read a disturbing NPR piece about how people with intellectual disabilities are far more likely to be sexually assaulted than those without. Thank you for raising this. Ellen thank you for responding. I hope that my comment did not come off as an attack on you but rather an expression of my need as a disabled adult to hold people in position of power responsible for the messages they send the world-both positive and negativeq. I feel like Pope Francis is not a bad person and thus if people hold him accountable he may look closer at his actions and the likely unintelltional messages they may send others. Again this was not a personal attack. I have enjoyed reading your blog both as an adult with disabilities and as someone who is preparing to foster/adopt a child with special needs. It wasn’t taken at all that way, Jessica. I appreciate hearing other thoughts and perspectives, blogs are much better for them—I don’t expect everyone to agree with me. (As if!) Congrats to you on whatever path you take toward having a child in your life, it’s the best adventure there is.